Bust N/A 35" 37" 39" 41"
Waist N/A 28" 30" 31.5" 33.5"
Length N/A 43" 43" 43.5" 44"
This retro style midi dress will take you for a ride down memory lane with a few contemporary updates. 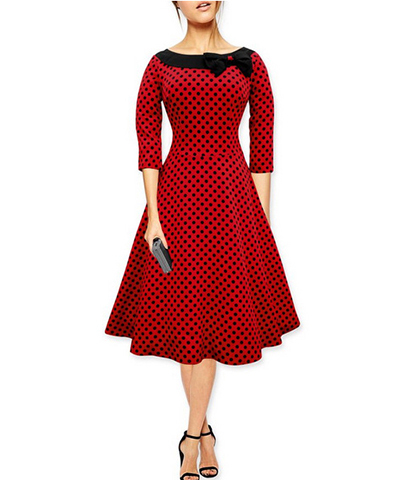 It is presented in a lovely polka dot print in navy, red or dark current. There is a black velvet, decorative neckline embellishment that is highlighted by a large bow that is offset to one side. The bodice is precisely fitted with a well defined waistline. The skirt is midi length, with the hemline ending at the mid-calf area. It is both full and graceful. The sleeves are three quarter length and snug-fitting. This dress zips up the back with a long, hidden zipper. This dress is available for purchase in sizes Small, Medium, Large and Extra Large.